Announced last week as one of this year's most interesting high-end Android handsets, the Essential Phone should be released soon in the US (likely before the end of June). While we know pretty much everything about the Essential Phone's specs, one thing that hasn't been made evident from the beginning was whether or not the handset would have an LED notification light. Fortunately (and despite the thin bezels surrounding its screen), the Essential Phone does come with a notification LED - this has been confirmed by Essential via its official Twitter account. 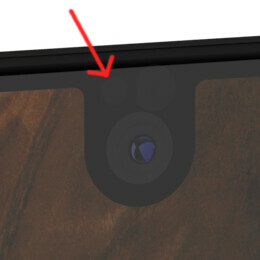 The new smartphone features an LED notification light squeezed in the upper-left side of its front-facing camera. According to Essential, "notification settings are controlled by the user", but it's not clear to what extent the LED itself can be customized. Although it's easy and cheap to pack a dedicated notification light inside a smartphone, not all relevant handsets have this feature - for example, the iPhone 7 and the LG G6 do not. Nevertheless, for folks looking forward to buying the Essential Phone, the presence of a notification light has to be good news, right? Actually, this is one of the many misconceptions about OLED displays. Please note, every display has a hardware circuitry called "display driver" which consumes a lot of power and which is off when the display is off, and is on when at least one pixel is on, even on OLED displays. So in order to display one pixel, even the OLED display consumes like 80% of the power consumed by the TFT display because the display driver must be turned on. If you take the LG G6 vs Galaxy S8 for example, the G6's Always On Display consumes less power compared to Galaxy S8's implementation of the same feature, albeit having a TFT display. OLED consumes nothing when it's black. What consumes power is the touch input which is always on. Even turning off a simple feature like double tap to wake on my oled phone my battery gets much better. Why can I only reply to this comment? Well, some company rely on those always-on displays while the phone is on standby. Are you daft? Why would an OLED have TFT? You do realize that TFTs are components specific to LCD screens, right? Who cares? This thing is DOA with that insane price tag. enough said. Reply to #3. PA pls fix. That's what people said with the Pixel. OMG! I WAS THINKING THE SAME THING! IT'S GENIUS!!!! BRILLIANT! I CANNOT BELIEVE THIS IS HAPPENING!!! IN MY LIFETIME! I thought it's the camera flash. To be honest, this is great news for me. Many manufacturers, most notably LG, have omitted this simple but very useful notification LED. A notification LED can be seen from a large distance (while the Always-On-Display cannot !) and can be highly customized. A phone without a notification LED or a form of active notification just forces you to look at it all the time and waste a lot of time (see the iPhone example). pretty sure LG is the only major OEM to have done this so far. I was honestly shocked when I realised the G6 didnt have one, considering the nature of their AOD and it's limited brightness. Miss those days when Xperias have those large 3 led Notification strips. Those were things of beauty and added flair to a somewhat simple feature. A little template for the Apple people. ( insert a feature from an Android device here) is such a gimmick. I would never use or had the need for ( insert feature here) . Android should focus on ( insert, lag, fragmentation, security, etc here). And if Apple ever does get it (insert feature here) it would be done correctly. That is why (insert something about Apple's financial's and be really passionate about like early retirement is on the horizon for you because of the great numbers). Stupid Android fanboys. I hope they have some financing like they did with the pixel through Google. I miss my little light. HTC hid theirs in one of the speaker grill holes...haven't had a notification LED for awhile now but I sure do miss it. I'd like to check out Essential's phone so hopefully it comes to Rogers. And the LG Optimus G Pro had a two notification lights. At the back of the phone and all around the front home button. Such beauty and eye-candy it was.